Total oil product stocks in Fujairah stood at 15.962 million barrels as of Monday, slipping 4.5% on the week as stocks of middle distillates fell by more than a quarter, according to latest data from the Fujairah Energy Data Committee, or FEDCom. Stocks of middle distillates fell by 25.4% to 1.919 million barrels, a seven-week low. In the jet market, demand for Middle East export barrels to Asia is cooling. Singapore jet premiums recently rose to multi-year highs, but demand has begun to retreat with winter heating season now over, S&P Global Platts Analytics said in a report. Stocks of light distillates also fell, dropping 12.5% week on week to 6.688 million barrels. 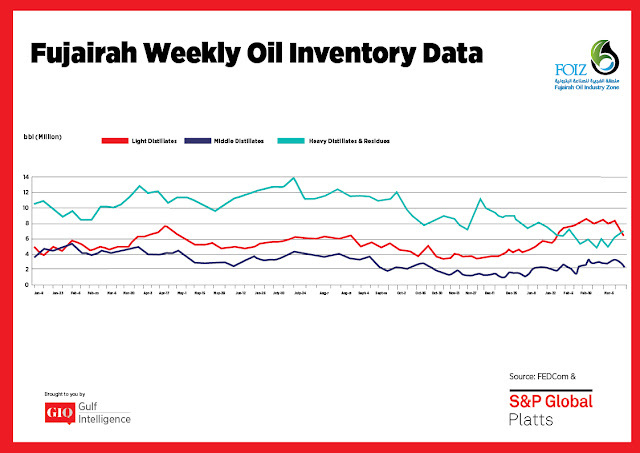 Demand in the Middle East is moderate, with spot premiums for Arab Gulf Gasoline RON 95 averaging $2.46/b so far this month, and the region is expected to be well supplied by European gasoline cargoes. 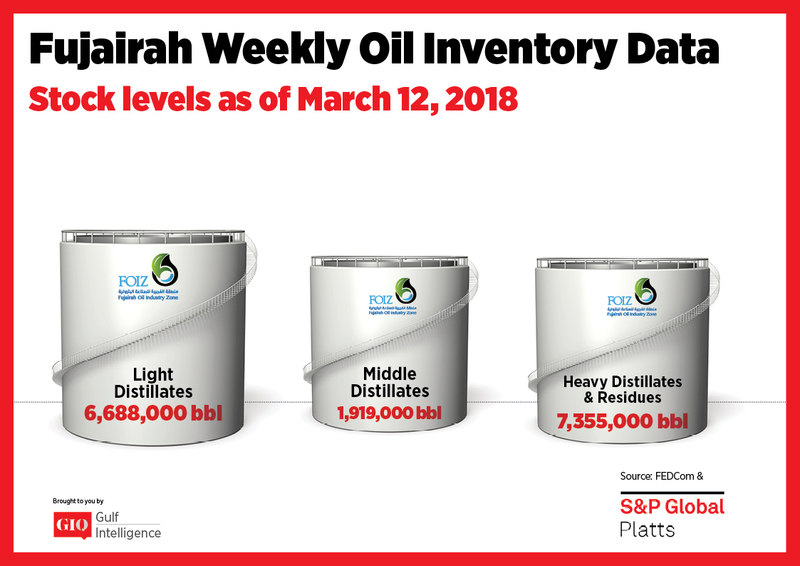 Stocks of heavy distillates and residues rose by 13.2% week on week to 7.355 million barrels, an eight-week high and continuing to rebound from the record low of 4.84 million barrels set on February 26. Premiums for benchmark Arab Gulf 180 CST FOB cargoes rose to a four-month high of $10/mt Tuesday, in line with the strengthening of the 180 CST price in the Singapore market, the report said. Market sources have attributed a widening viscosity spread to early pricing in of the IMO's 2020 bunker fuel regulations. The lower sulfur limits are expected to lead to a big increase in blending activity, which could increase demand for lower viscosity material. Futures contracts for January 2020 are currently pricing a $20/mt spread between 180 CST and 380 CST grades, compared to a historical average of around $6-7/mt. In the near term, stronger premiums and backwardated front-month time spreads are further factors discouraging higher stocks.